Putrid red gases spew from Coit Tower, a mysterious mound slowly swallows the Transamerica Pyramid, and everybody begins to disappear. It's San Francisco in the future, and these circumstances pose compelling questions. The answers, found in Sierra's Manhunter 2, are simple. Alien orbs have taken over, and they're spreading horror, tyranny, and death. But the orbs don't do it directly. Instead, they have helpers—robots and you. For you are what is known as a manhunter. Your job: to hunt your own kind. Under the direction of a supervising orb, you track down those who have offended the orbs' delicate sensibilities. To help, you have a Manhunter Assignment Device (MAD), a sort of portable PC with dedicated manhunting software. It works in conjunction with electronic tracking disks, which the thoughtful orbs have implanted in everybody's neck (including yours). But the tracking system only works when the quarry is above ground. When the game opens, you're in hot pursuit of a baddie named Phil. He's the nasty killer sort. You're just about to close in when—wham!—you smash into the side of a building and crash to the street. Unfortunately, you fall atop a fellow manhunter, rendering him essentially two-dimensional. It's not a pretty sight. Phil hovers above you, laughing wildly, then zooms away—and you're on your own. The object of Manhunter 2 is, among other things, to explore various places throughout San Francisco. That is done with the help of an onscreen marker that's smoothly controlled using the cursor keys or the joystick. 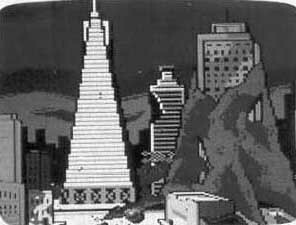 A building is swallowed by a mound that appears in Manhunter 2: San Francisco. The marker is interesting and itself becomes an important part of play. It changes shape when positioned over important objects, and the shape it assumes gives useful hints. For example, an open hand indicates that you can take or manipulate the object; a pointing finger tells you that you can press or push something; and a magnifying glass suggests that you can take a close look al something. Further exploration may turn your marker into a question mark, which indicates that something is displayed in the message bar at the bottom of the screen. Read it, and you may get a useful clue concerning that object. After exploring a particular screen, it's travel time. Pressing F3 brings up the travel map. Your current position is shown by an X, and orb-approved destinations are indicated by blinking squares. You can move to the next map section by moving your marker to the edge of the screen. As you track Phil through San Francisco, you'll do more than manipulate markers. From time to time the view will shift to third person and you'll be faced with arcade-style obstacles. Less experienced adventurers will like the game's interface because it eliminates a lot of frustration. More experienced players, however, may wish for a greater challenge. But players of all levels will appreciate the exceptional graphics, the variety, and the alternating tension and humor. The game's command summary card, a quick-reference sheet, and the Official Manhunter's Field Guide are a lot of help to the neophyte adventurer. Manhunter 2 runs on systems with Hercules, CGA, EGA, MCGA, or VGA monitors. Admittedly, Manhunter 2 is probably a bit simplistic for dyed-in-the-wool adventure fans. Even so, it's addictive. If you're a newcomer to the genre or you're just curious about why the Transamerica Pyramid is being buried by that mysterious growing mound, then here's a game you'll enjoy.